4,050 copies (5,000 contracted); published for Brigham Young, Heber C. Kimball, and Parley P. Pratt (by J. Tompkins, Liverpool, England). This first European edition was printed with the permission of Joseph Smith; it is essentially a reprinting of the 1837 edition with British spellings. 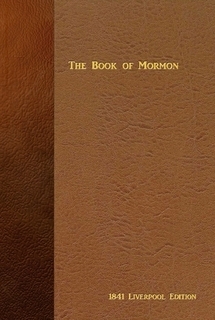 In February 1841, the first copies of the 1841 edition of the Book of Mormon were completed and the copyright was secured on February 8, 1841. Though Tompkins was paid to print 5,000 copies of the book, only 4,050 were produced.